Fantastical tale of a young boy who is dealing with the slow death of his mother. 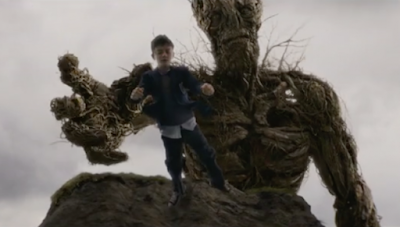 He is visited by a giant tree monster who helps him deal with grief by telling him stories. Deeply moving film that impressed the hell out of me. The story is profound in its way, the characters atypical and real. The visual sense is amazing. It is in it's way a damn near perfect cinematic fable whose only flaw being the casting of Sigourney Weaver- not because cause she is bad rathe because she stands out too much. Despite not wanting to see the film (I have libraries of of undealt with volumes concerning the death of my own mother) I was genuinely moved by the film. I suspect that because I could relate directly to the tale the film meant so much more to me. I can not say much more than that- except that the final two shots are absolutely perfect.